Well since you all LOVED the “movie” of Alexa and Amber I did a movie/photo clip of Alexa getting her Surprise Princess Party Dress! You all have followed Alexa’s story and agonizing journey I thought you may enjoy this. Wait till her party! Now that will be a great video. All the details leading to this video can be read below. Not a reader-no problem-watch the video! BTW-I hate my valley girl voice, and I am originally from Massachusetts hence the probable accent. Her actual birthday is the 29th! I got ONE RSVP to her party today, and am anxiously awaiting more! Alexa is so excited for her Princess Costume Party-its insane! I was quick to ask her if she wanted Cinderella instead of the purple and she basically spared my feelings by saying “Well this one is pretty too! Its OK Ill wear this one to my party” I thought OH GREAT! She’s secretly disappointed. Now THAT is the type of thing you NEVER forget. I can see it now-20 years from now…………………………..
Well you know I couldn’t let that happen! The girl wanted a Cinderella dress ,well then she was gonna get a Cinderella dress. You only turn 8 once ya know! So my online hunt began! For a mere $60-$80 I could get one online! GULP! Explain that to a DAD! Guys do NOT understand nor do they care about the NEEDS of an 8 year old girl, who NEEDS a Cinderella dress! Let alone one at the cost of $80 then shipping! My dear, sweet, very pregnant-like due literally today-PSF friend Tracey said Hey Im going to go to the Disney store and try to find a dress for you! She knew there was not one close to me, and the kids have been sick! So she and her very preggers self, along with cutie pie daughter Shannon not only went there to find the PERFECT Cinderella dress but they found the matching GLASS LIGHT UP SLIPPERS! HELLO!!! The dress was on SALE! $25! Unless she lied to me and in that case I would NOT be happy! And its beautiful! Thank you so much girls for helping me find the perfect dress for Alexa’s party! I wish Shannon could go! Paulette-if you are reading this I would love for Ally to come but was unsure if it was “too young” for her. If not, let me know. She is just at that ‘age” when you arent sure what is too young for her KWIM?? So anyway-that is the whole dress story! Imagine when the girls get married! Good Grief! I did get an amazing compliment about the invite and party festivities! Cant Wait! Well I better TRY to go stamp something! Havent done that at all today. Tomorrow I’ll share my Blogger’s Challenge! (Oh yeah now I really need to get inking), and a Smilebox of our Apple Picking adventure. Wait till you see Amber sing a song! OMG! WAY cute! In the Spotlight different take-dessert, princesses-and whats to come. I really want to thank you all again for the thoughts and prayers for Alexa. She is a little junky with her cold, but no fevers, or progression of the cold so far. She is so enjoying school. Her reading/writing are coming along great. I hope she can remain living a “normal” life as possible this year. Also, thanks for sharing your stories with me as well. Ido read EVERY comment and email that gets sent my way! I love hearing form you out there in blog/stamp land! I love the personal emails as well. Dont ever feel like you are bothering me! LOL! I get alot of that wording. It may take time to get back to you but its not bothersome. Im in a much better mood today, and *may* get some MYTIME! Lets hope! I just need the ambition! Amber and I went on a fieldtrip Apple Picking this morning, so you can expect the CUTEST Smilebox later! Plus some awesome Nana’s Apple cake from Tastefully Simple is going to be on the dessert menu! Its my favorite! And Im not a huge apple flavored anything fan! I swear-its just the best. I just tried the Old Fashioned Bread Pudding-with banana and nuts added-OMG! To die for! Ok Im going off on another direction again-sorry! So-Another Smilebox will also be posted of Alexa! My friend Tracey found her the most perfect Cinderella dress for her Princess party (still no RSVP’s) next weekend with matching shoes that light up! Im going to catch her reaction on video! So stay tuned! Thanks Tracey-I had to peek real quick first! She’s gonna be so excited! Noah had a great soccer game yesterday! Im so proud of him. His team has been working so hard, and each time it really shows. Im just happy he loves it! I made this card a little while ago, and forgot ALL about it! LOL! I was inspired by a skirt I saw that had black satin fabric, with white/gray tulips. It sounds gross but really is pretty. 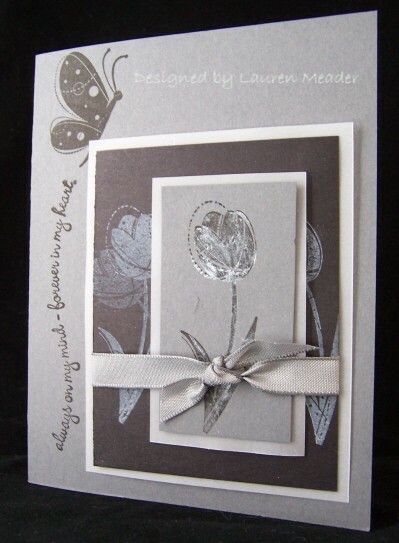 The shimmer in the main tulip is from Lumiere, that I painted onto the stamp, then stamped onto the cardstock. I thought it was a different take on the “spotlight” technique. Being that THIS tulip POPS out at you. The other tulips are soft in the bkgd. Tulips are my most favorite flower and I loved using them in this way. By that I mean colorless! LOL! What a fabulous sympathycard dont you think? Or thinking of you? I love the tone on tone. Gray, Black, White, and vellum. LOVE IT! And that ribbon-to die for! If you dont know this set is Garden Whimsy by Stampin Up! I LOVE that set, and didnt get to crazy over much this catalog so want to put what I did get to use. Im just in awe of this one. I just really like it. OK Im off to stamp-I hope. Check in later, as I HOPE to post my Smilebox stuff. Hope YOU get some MYTIME!